Apple has always worked to be dominant in the creative professional industry. In 1997 Steve Jobs came onto stage at the Boston Macworld and stated that ““80% of all computers used in advertising, graphic design, prepress and printing were macs” and “64% of Internet websites are created on Macintosh”. Not only has Apple been a leader in the creative industry, but they also have pioneered many firsts in the world of computers. In 2001 Apple won the Primetime Emmy Engineering Reward for their Revolutionary Interface, the Firewire 400 which transferred data at 400Mbps, 30 times faster than the original USB standard. Most recently Apple and Intel Engineers have come together to introduce the Thunderbolt Interface which runs at 10Mbps, twice as fast as the latest and greatest USB 3.0 standard of other manufacturers. I myself have had a similar experience of migrating to the mac. My first home computer I purchased in 1996. It was a Pentium 3 600Mhz PC with 128MB of ram, and a 40GB hard drive. 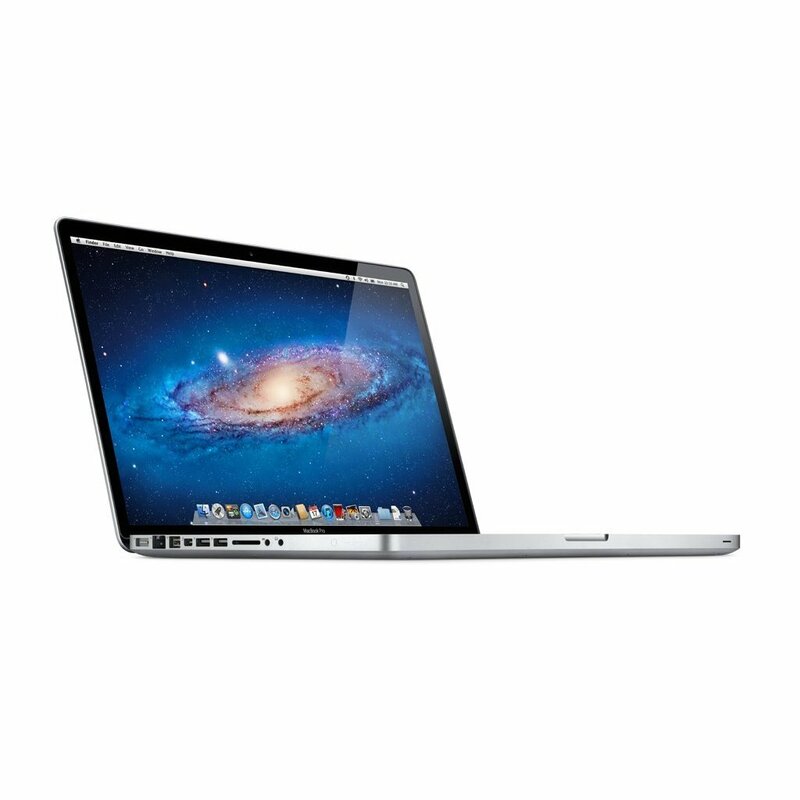 Since then I’ve used various laptops and desktops running Windows 2000, ME, XP, Ubuntu Linux, and finally in 2005 I choose to try out a mac, when I bought a 13″ ibook G4. Since then I have chosen to stay with the OSX platform because it just works. Windows works fine for a while but eventually you run into having to defrag your hard drive, run disk cleanup, and registry issues always seemed to come up, all of which would slowly chip away at my productivity, when trying to do simple things like making a DVD of a picture slideshow. Since that time, I’ve not only been looking at continuing to use a mac for my wisconsin wedding videography company, but I’ve been looking at how to increase the productivity of our workflow, by eliminating the most time consuming tasks of importing video. By far the most time consuming task in the world of video editing is importing, exporting and trans-coding video footage. After reviewing the Panasonic HMC40 we chose that camcorder as our primary camera for the business, which captures footage in the AVCHD format. Since then when trying to be as productive as possible, I did my own personal test on how long it would take to import an 8 minute and 47 second clip, captured on a transcend 32GB class 10 card. I traveled to a few apple stores, and a local best buy, and simply timed how long it took to import this clip into various macbook pro’s, macbooks, imacs and Mac pro Machines. 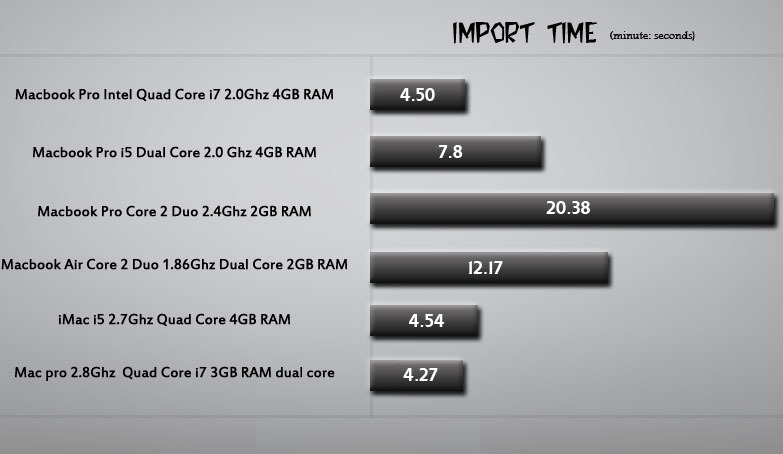 Given the results of the test, I can conclude that the biggest bottlenecks in importing / transcoding video are the processor speed, and the amount of ram, and here’s where you can see the difference between a quad core and a dual core processor The import of footage on a dual core i5 processor took 7 minutes and 8 seconds, and the very same import on a quad core i7 took 4 minutes and 50 seconds, 67% faster in a laptop. From the results of my test you can also see the difference between the i5 and the i7 quad core processors, and how the i7 takes advantage of 8 way multitask processing. The results are similar, yet with the iMac i5 2.7Ghz quad core machine importing in at 4:50, and the Mac Pro 2.8Ghz quad core i7 processor in the Mac Pro importing at 4:27, 8% faster. Keep in mind this is the result of 1 clip being imported, if you are filming a total of 120 minutes of footage from 2 cameras, which is typical for filming intro clips, interviews and filming a wedding ceremony, a quad core i7 macbook pro will import all footage in this scenario in 66 minutes. The same Macbook pro i5 dual core machine would take 96 minutes, the quad core i7 macbook pro imports the footage 68% faster. While I haven’t done benchmark tests in Photoshop, Aperture, or Logic, but you can reasonably predict that similar measures of efficiency would conclude that if your looking for the most efficient mobile laptop that can deliver the best performance and reduce your cpu intensive tasks such as photo and video format changes, the quad core i7 macbook pro is the way to go. You did an accurate analysis comparing the Dual Core to the Quad Core philosophy. It's been an interesting read. Keep it coming and thanks for sharing. For me Quad Core Vs. Dual Core. Quad wins it has high specs than Dual. Excellent Post! This is great.I found all i have been looking for in this post.Can you add more postings on computers.Looking forward to read more ideas from you on all compters ,laptops ,notebooks and all types of computer softwares.I have bookmarked your site. 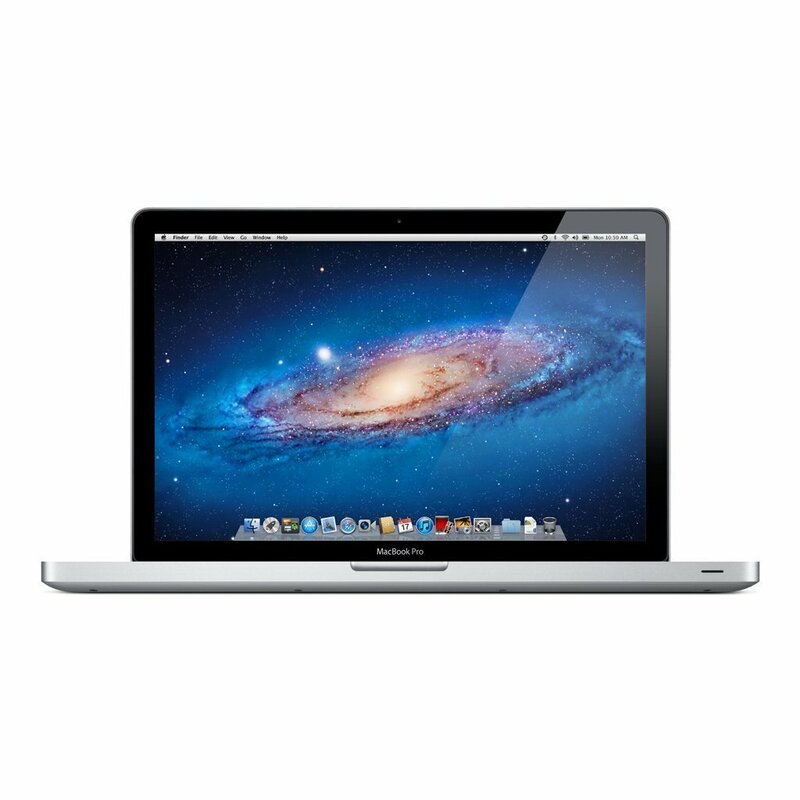 Great site of comparison between Quad Core vs. Dual Core Macbook Pro. Because of this, i got now an idea what to be considered when purchasing this item. That is, Dual has less specs compare to Quad. Thanks for the comparison posting between Quad core and dual core. A very informative site that should be people must read. Now i know what to choose and the advances of each core. Wow, so nice good comparison Quad Core vs. Dual Core, thanks for sharing good info. I'm glad you enjoyed the article. If you have any other insights that you would like to know about the macbook pro, let me know and I can work on posting another article with more insight.